I sit in my “magic chair” looking around the empty room. Monica nicknamed it the magic chair because it’s so wonderfully comfortable that every time she sits in it she falls asleep. I don’t usually sleep in my magic chair, but it is magic in the best sort of way. I spend a lovely hour of quiet time here just about every morning. The room is always so peaceful…so full of just the right kind of morning light. I’m surrounded with some of the things I like best in the world. My books – the shelves are filled with books and pictures and interesting things like an hourglass, an abacus, a little world globe… And the mantle clock on top of the book shelf cloaks the tyranny of time in beauty. So I sit here in the mornings. I pray. I read my bible. Sometimes I watch the fish in the aquarium. Sometimes I take a hymn book from the piano and sit here and sing quietly – thanking God that everyone is still in bed and probably can’t hear me. But it’s different this morning. It’s kind of echo-y. The familiar overflowing bookshelf now stands naked. The books are stacked in six boxes in the garage. The tables are gone…the lamps, the rocking chair, the little book shelf. They are all stacked in the garage and on the wood floor of John’s office. The big empty bookshelf, the piano, our 60-gallon aquarium… and my magic chair. We’ll need help to move these four things…somewhere. And then, the carpet man cometh! In recent years John has been saying, “One should get new carpet every 25 year or so, whether you need it or not.” And our kids have told us that we really need new carpet. I have been the lone holdout. But this is the carpet to which John carried his new bride almost 27 years ago. This is the carpet where our babies learned to crawl and walk, and where the kids sprawled to play games. It’s probably been steam cleaned a hundred times over the years – and that is another family adventure memory. I like it. I’ve really never seen the need of new carpet. I like the colour of this carpet…it still has nap…sort of. John has been talking about new carpet for a long time but I always say I’d rather spend the money and the time on a nice trip somewhere – and he ends up agreeing with me. And we have had some wonderful vacations. 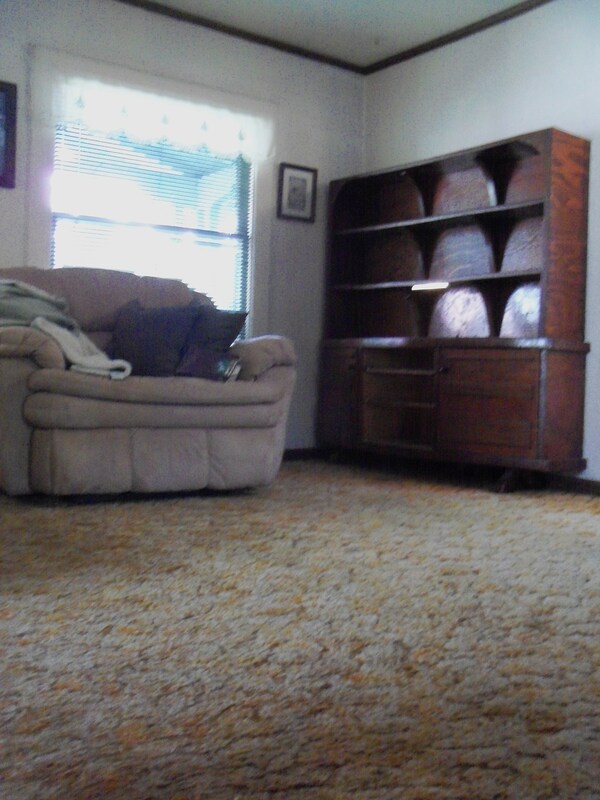 But one should really have new carpet every 25 years or so…or so they say. So we decided that this year we will have a carpet installation vacation. I can hardly wait! I love your perspective on things. Birkenstock tracks and baby urp are great reasons to preserve the old carpet! But, think of all the NEW impressions to be left…the echoing laughter of your growing family and grandbaby handprints. Fair trade! Very true Judi. I am excited, but aside from the sentimantlity it’s a pretty daunting task. That’s why I sit at my computer instead of packing up the rest of what needs to be stashed somewhere… Hugs to you for your input! EEEEEEEEEEEEEEEE! I can’t wait to see it! It’s gonna change everything! I’m coming home to a new house in 2 weeks! Andee – can you keep a small scrap of the carpet? Maybe you should make an ornament with your “first carpet”. Similar to your Christmas tree trunk slice collection. Rita, we are thrilled to have his company on the job!!! We saw what a great job he did on David’s house and we have heard from other people in the trades that he is one of the very very best!